RE•WORK | Blog - Could an AI bot solve emotional weight gain? Could an AI bot solve emotional weight gain? Emotions are one of the things that set humans apart from machines. In everyday life, we experience countless alterations in mood affected by a variety of factors both internally and externally. This is something unique to us that machines are incapable of. We know, however, that machines can be taught to have an intelligence often superior to our own which makes them ideal for carrying out certain tasks and jobs. Take the medical industry for instance - a machine is able to diagnose a disease or illness with more precision and in less time than a human doctor - but how would you feel about getting therapy from a robot? Whilst your immediate reaction may be that the machine wouldn’t be able to empathise and treat the patient effectively, over the last years AI have got increasingly good at reading human emotions and responding accordingly. At the AI Assistant Learning Summit in London last month, we heard from several researchers working with emotional and psychologically aware AI. 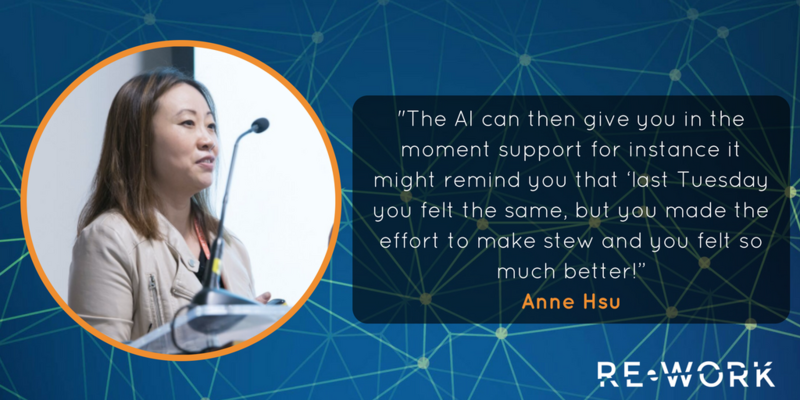 Speaking about her research at University of London, Anne Hsu shared how her work in psychologically minded AI goes beyond empathy and focuses on understanding interest, intent and motivation in a cognative manner. Anne is currently working on an AI that can be more empathetic and assertive with a robust ego which are all key to attitudes and behaviours - in this case with regards to diet and weightloss. Often over eating is an emotional reaction to a situation, and the key question that machines aren’t able to understand however, is ‘why we feel and do the way we do’. Anne explained that this ‘goes far beyond the individual and their own internal emotions’ and can be impacted by the ‘health and success of your family, school, work - the community is influenced by the type of environment that is created.’ These environments can be stressful and demanding of people, pushing you ‘into a state that doesn’t allow you to access your own psychological mindfulness’. With this in mind, Anne explained how it’s important to identify different elements that influence emotion and psychology. These motivational concepts require an understanding of the situation and the specific context. Anne spoke about the domain of weight management, an unsolved problem which is often heavily impacted by emotions - people are often successful in losing weight but then put it back on. There are lots of apps out there to help with meal planning and calorie counting, but really someone to stay accountable to could be the answer. If you understand the reasoning behind the overeating it might be easier to manage - maybe it’s affected by social situations, tiredness, your mood. What if you had an AI assistant that provided you with context specific advice? To create an AI assistant that’s capable in doing this, Anne is training her model to recognise when someone is reacting in response to emotions and making suggestions based on previous patterns. For example ‘in the moment help is provided if a user is driven to eat when they provide context based evidence - the AI can suggest a similar situation in which you felt like this before and give you an idea of the bigger picture, suggesting why you might be inclined to eat.’ The aim is to be accountable to something that understands the context of your emotions, much like a friend you might ask advice from. These agents can understand users’ motivational underpinnings and can thus provide empathic, context-sensitive dialogue. At the end of her presentation, Anne opened the floor to questions, and was asked how they will be identifying and then replicating cases where the user is actually hungry and trying to stick to a diet rather than emotionally craving food. Anne explained that the model will ask the users when they last ate and when the last time was they were tempted to eat to try and identify a pattern. Another interesting discussion point was having the chatbot preempt hunger and tell us what to do now to try and avoid hunger later. This was something Anne hasn’t explored thus far, but will look into in her research. At each edition of the RE•WORK AI Assistant Summit, we are joined by experts working in the field to learn about the next generation of predictive intelligence and how the advancing trends in AI assistants are impacting both business efficiency and personal organisation. To learn more from leading experts join us in San Francisco this January to explore the next generatioin of AI assistants. register now to guarantee your place at the summit. Confirmed speakers include: Elena Sokolova, Data Scientist, Booking.com; Rushin Shah, Engineering Leader, Facebook; Nikhil Mane, Engineer - Conversation AI, Autodesk, Deepti Yenireddy, CEO & Founder, My Ally & many more.